Thanking Employees is an important part of your overall Recognition Strategy. Everybody likes to be thanked, and the people that work for you are no different. 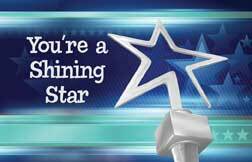 See this sample of a Spot Award Card themed for You're a Shinning Star. Good for one gift of their choice! It's the perfect way to say thanks for doing a great job! Here's some ways we can help make saying Thanks very easy.